Was the sunroof a standard item on the 4S and therefore non-sunroof models are a specified factory delete option? Still waiting for my COA from PCGB. Yes. I love having the choice of sunroof or aircon, and often both at the same time. Apart from being tall, I cannot understand why anyone would delete it at point of order. I did come from 2 rag tops prior to the 996 so may have been an influence. As I understand it, they were a no-cost option. I wish my car didn't have one, it adds a whole bunch of weight right where I don't want it. One of these days I'll be investing in a carbon roof a la CLR. I also can't think why anyone would request no sunroof at point of order however I do love the clean lines without. Didn't think about the weight consideration either. Are the sunroofs/seals/motors etc. generally trouble-free? I am in the sunroof is just a useless added weight in the wrong place group both my 997s have had sunroof delete which was great you have ac you have windows why would you want a rattley old heavy lump on the roof of a sports car. when I see Gt3s with sunroof I will know all is lost in the world lol. Mine's without and I quite like it that way.. It is confusing and I'm not sure that the CoA will answer your question. I've just looked at my records for my 2002 C4 (non S). My car had a tilt/slide electric sunroof. According to a VIN decoder it had Option M350 which is an electric sunroof. BUT no option number for any sort of sunroof was listed on my build sticker. HOWEVER My CoA is showing 'Sun Roof' under optional equipment fitted. My conclusion which is purely a guess = 'Sun Roof Delete' was the option. I was just curious as most seem to have S/R and I have seen some advertised as 'Sunroof Delete' like that is a selling point. Seems less around without than with. How can I check my build spec by using the VIN? I don't know now. The free on-line decoders that were around several years ago don't seem to work nowadays. iirc there is someone on the forum that has access to such info so it might be worth starting a new thread asking the question. So yes the option was to delete. Don't think many did though, I had a C4S for 10 years - it had the S/R. Had a few issues over the years. 1st rattles - there was a Porsche tech. bullitn on how to resolve so it must have been a common issue. 2nd keep the drains clear else you'll end up with damp carpets behind passenger seat. 3rd Micro switches failed causing it to bounce on closing. That's interesting to hear. I wasn't too fussed either way but perhaps it's just as well I don't have one, would have liked PSE tho but again I have heard that it's costly to replace. FWIW, I think the sunroof delete makes sense on a coupé, seems to suit the ethic of a drivers car more IMHO. Not sure on the 996 but I've had a sunroof cassette/mechanism etc out of another (German) car before and they're surprisingly heavy - significant amount of weight high up in the car that rarely gets used. For open top/airy motoring there's the targa or cabriolet? In he winter it's great with the heater on and sunroof open plus you don't get blown to bits like you do in a cabrio. I have to agree, it's a bit strange to delete the S/R but still love mine... oh and the Slate Grey. 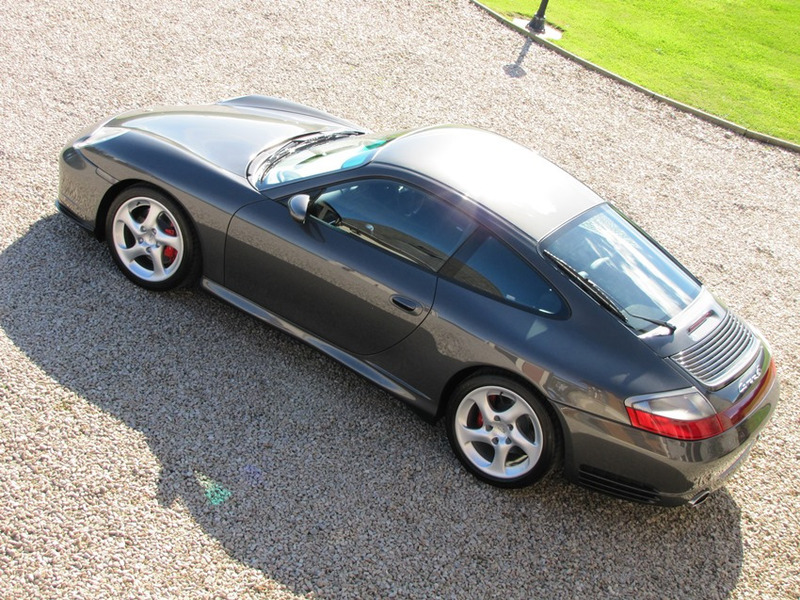 2002 996 C4s slate Grey, Manual with Kline Innovation exhaust system. Was going to to say my old one didn't have one, old LOO doing well then? What can I say, just amazing. Nearly a year of ownership and running like clockwork! Just had to sort air con but other than that all perfect.